Living Links Coordinator Sarah Maclagan was thrilled to attend the International Parks and Leisure Congress 2018 earlier this week. 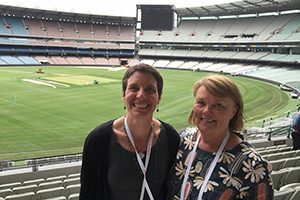 Held at the iconic MCG, the congress brought together parks and leisure professionals from across the globe to share knowledge, experience and ideas around the theme ‘FUTURE of SPACES and PLACES in CITIES’. Access to high-quality public open space is a key ingredient of healthy, liveable cities and towns. This has long been recognised in government planning policy, and academic research showing that accessible green spaces lead to better health outcomes. Yet our cities are growing rapidly, and with that we are seeing increasing populations, greater housing density, rising temperatures, growing rates of obesity, diabetes, stress and depression, and declining native biodiversity. With Melbourne’s population set to double to 10 million people by 2051, more than half of the houses that people will require at that time have not even been built yet! That means we need to be taking action right now to plan and set aside sufficient areas of green open space. Sarah was inspired to hear about the work being done in all different parts of Australia and the world, and gained lots of fascinating ideas and insights that she can now apply to the Living Links program. Living Links is a collaborative program working to create a network of green open spaces and recreational trails across south-east Melbourne. Learn more at www.livinglinks.com.au.